Currently there's an Ohio-shot film making a certain amount of hoopla on the indie circuit. No, not THE AVENGERS which destroys downtown Cleveland (about time), but a modest-budget psychodrama largely shot in Lorain County. It’s TAKE SHELTER, about a working-class Ohio man named Curtis LaForche (Michael Shannon, an Oscar nominee for REVOLUTIONARY ROAD) afflicted with an obsessive religious mania that a "Left Behind"-style apocalypse is nigh, and how his apprehensions destabilize his family. The supporting cast includes Shea Whigham, Katy Mixon, Kathy Baker and, as the wife of LaForche, Jessica Chastain. Columbus child actress Tova Stewart, 6, makes an auspicious debut as Curtis’ daughter who is deaf and who contributes to the imploding father’s anxieties. The film was written and directed by Jeff Nichols, whose Faulknerian debut feature SHOTGUN STORIES stirred the critical establishment with its realistic, dead-on depiction of a modern-day blood feud in the American south. 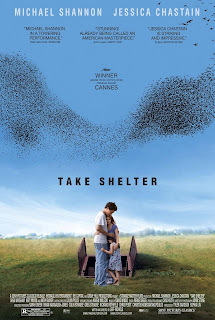 TAKE SHELTER was produced by Tyler Davidson, a part-time resident of Russell Township, just west of Cuyahoga County. "I couldn't have imagined a better reception for the film," said Davidson, when he returned from TAKE SHELTER’s bow at Sundance. "The wait-list line stretched around the building to get in to the Eccles Theater, the 1300-seat venue where the film was first shown. The screening itself, and certainly the audience ovation that followed, was a powerful experience for me and my wife...as well as for the many others there who were a part of the project." Davidson has been involved in features since assisting the production of THE YEAR THAT TREMBLED, a 2002 drama of the Vietnam-era war protests in the Kent State University community, shot on location ten years ago. Based on the novel by Chagrin Falls writer Scott Lax, THE YEAR THAT TREMBLED is now widely available on DVD. TAKE SHELTER lensed on a 24-day schedule in June and July of 2010, in and around Grafton, LaGrange, Elyria and Oberlin, plus Geauga County. The prairie-like landscapes appealed to the filmmakers, who used 35mm wide-screen format. "Director of photography Adam Stone does justice to the beautiful horizon lines of LaGrange Township," said Davidson. Sophisticated computer f/x, by the Hollywood-based workshop Hydraulx, evoke the lead character's eerie visions. The audio mix was done at Skywalker Sound Lab at George Lucas' Skywalker Ranch in Northern California. Overall, the budget of the film has been stated to have been less than $5 million - $700,000 of which was spent in Ohio. Davidson has other plans for further film production here. “I start production on another feature this month in New York, and am consulting on a second that will shoot soon in and around Cleveland."